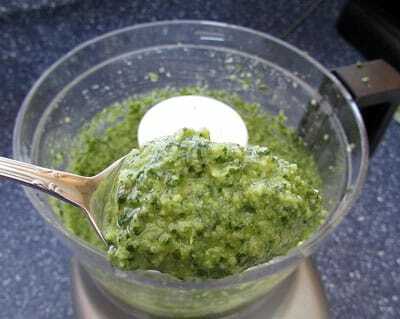 An easy recipe for basil and garlic pesto with a secret ingredient that cuts the cost in half! Includes bonus recipes and freezing tips too. Basil, basil, basil! It’s tucked in here and there in our front yard garden and also in the raised beds in the back. We use it in tons of our favorite recipes–Crock Pot Spaghetti Sauce, on pizza, in Spicy Red Chicken, in pasta salad, and lots more. And when you pair it up with garlic…oh boy. That’s a combo that can’t be beat. 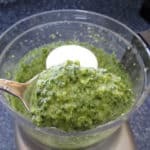 To preserve our basil harvest, I make and freeze huge batches of pesto every summer. Last winter, I ran out of homemade pesto and nearly died when I saw how much it costs! A teeny jar is $5, and it doesn’t have the extra-garlicky bite that our family likes. Now, I know what you’re expecting me to say. Yes, you’ll save a lot of money by growing your own basil. 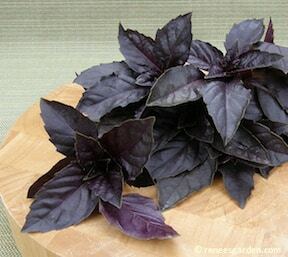 My favorite variety is Italian Genovese from Renee’s Garden, although it’s fun to make purple pesto with Renee’s Purple Opal basil. The kids will love growing that one. 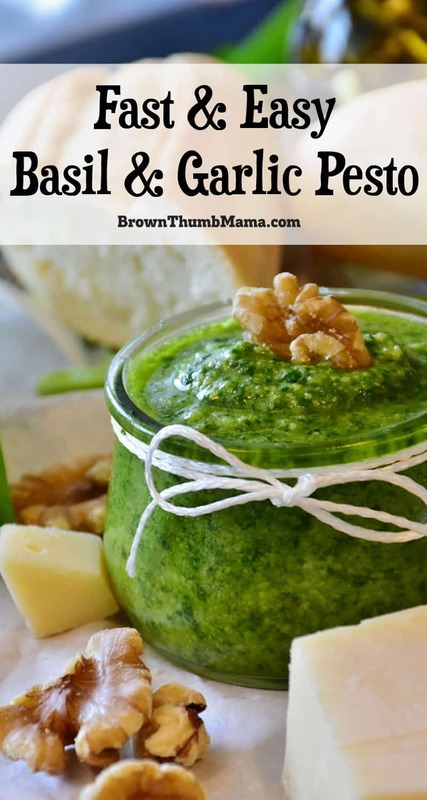 As a quick review, traditional pesto uses basil, garlic, parmesan, pine nuts, and olive oil. Can you guess which ingredient we’re going to replace to save big bucks? Yep! It’s the pine nuts. These little guys must be gold-plated, they’re so expensive. 30 bucks a pound? Heck no. Here’s the secret to making cheap basil pesto. Replace the pine nuts with walnuts. They have a similar texture, the flavor works great with the other ingredients, and they’re a fraction of the cost of pine nuts. Let’s do this! 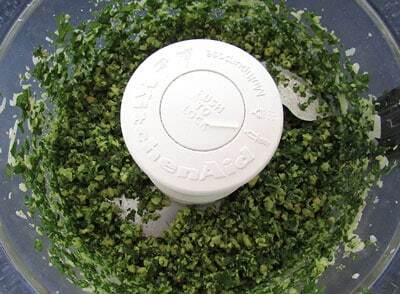 Food Processor: the best way to pulverize the ingredients into a smooth pesto sauce. Grater: easily grates the parmesan cheese into the perfect size for this pesto recipe. Small Canning Jars: the pesto can be saved in canning jars in the freezer for future use. Put the basil, garlic, walnuts, and parmesan in the food processor (this is the one I use and love) and pulse until everything is broken down, like this. Add the olive oil in a thin stream as the processor is running. Process until it reaches your desired consistency. I freeze pesto in small canning jars and also in 1 Tablespoon scoops, just like I do when freezing garlic. Fresh pesto will keep in the refrigerator for a couple of weeks. 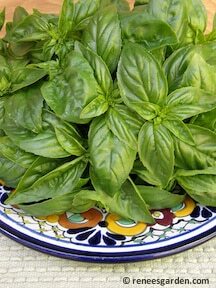 The top layer may become dark, just like basil darkens when it’s cut. It still tastes great, though. Toss pesto with pasta, add to your favorite spaghetti sauce, or put a layer or two in your lasagna for a flavor boost. Add it to your homemade pizza crust when kneading and tell your kids it’s space alien pizza. Mix pesto with bread crumbs, stuff mushroom caps, and bake for a yummy appetizer. 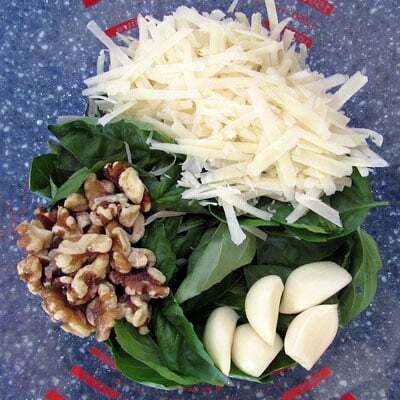 Put the basil, garlic, walnuts, and parmesan in the food processor and pulse until everything is broken down. Another down side of pine nuts is that oft times they are imported and folks not normally allergic to pine nuts have intense reactions. Apparently our bodies can easily accept nuts from local trees but not from trees abroad. For this reason and my budget, I use cashews (because that’s what I have on hand most0. My sister has a nut allergy, so I’ve found that seeds also work well. I like pumpkin in the fall and sunflower all year. Would pecans work instead of walnuts. My husband has a walnut allergy. How would cashews change the texture and taste? I have never made pesto but we love it. Any nut will work – it’s about your taste. Also, I made an asparagus pesto and froze them in an ice tray. Once they are frozen pop them out and put them in a zip lock bag. Now you have as much or as little pesto for your meal(s) as you need. Love this recipe.